It sounds like a science-fiction fantasy, but the company Mars One says it’s for real—and that it will really establish a settlement on the planet Mars by 2023. By the way all I need to become a successful screenwriter, is a lot of cash, ideas, and the four connected Industry Power Players willing to finance my own personal Ishtar. The idea is to first send rovers, which will stake out a good site for a settlement and then build out living units. In 2022, the crew will take a “transit habitat” for the seven-month trip to Mars and settle in to their new home. The intention is that the crew will live on the planet for the rest of their lives. Every two years after that, another group will join the settlement to populate the colony. Think of it as a “Big Brother” for outer space. Already, the other-worldly idea has intrigued the Web. 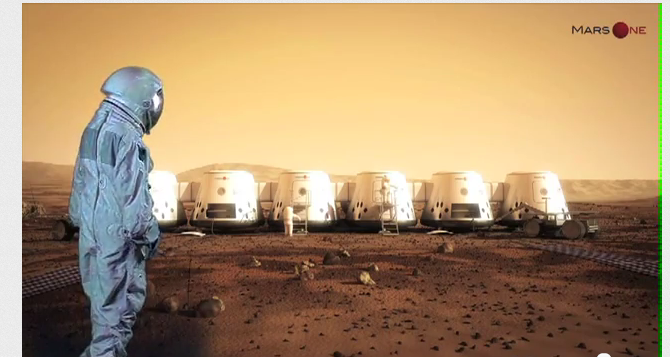 The Mars One video has received over 232,000 views on YouTube since it launched less than a week ago. How the hell do you make money from a media event? Through advertising? So does that mean you’re going to “work with brands”? Where have I seen that logic before And….what do you mean by “Big Brother”. We’ve moved to a reality-tv based funding system? Which means, I guess, only the sexxxxxy scientist willing to poop on camera need apply. 1972 was the last time humans worked on the moon. You can always find a Nobel Prize winner willing to trade on their accomplishment. Mars One is Dutch for Suicide Mission. We can send a rover to Mars, have it build human settlements, fly people to live in them, but we still can’t photoshop worth a damn. Forrilla tho, The Dutch must have exploration in their very DNA. I’m very excited about this project.